London Dairy Supply’s Stronghold 3505 is a heavy-duty acid rinse featuring a concentrated formulation of Phosphoric Acid and Sulfuric Acid. It is designed for use following CIP Detergent. 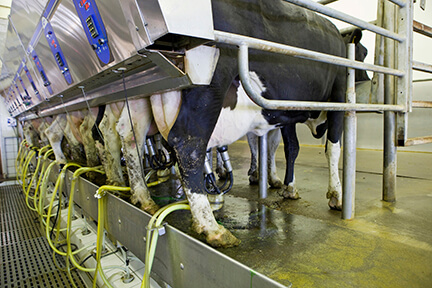 Milk and water mineral deposits (milk stone) may consist of milk solids, calcium, magnesium, iron and sulfates. These deposits can become hardened and layered on equipment surfaces, harboring biofilms of adherent macro-colonies of bacteria. Stronghold 3505 is formulated to completely neutralize alkaline cleaners, and react with milk minerals and milk stone deposits, which are then carried away in the rinse cycle. Acid rinses such as StrongHold 3505 may also help protect against corrosion. Heavy-Duty acid rinse for use following CIP Detergent. Concentrated formulation of phosphoric acid and sulfuric acid. Dissolves mineral deposits, neutralizes alkaline cleaners, and reacts with milk minerals so they can be removed in the rinse cycle. Helps keep equipment surfaces free from hardened deposits which can harbor biofilms of bacteria. May help protect against corrosion. Phosphoric acid is widely accepted as a superior acid for dissolving mineral deposits. Phosphoric acid rinses are formulated to neutralize alkalinity and react with milk minerals so they can be removed in the rinse cycle. Phosphoric acid rinses should only be used following a chlorinated alkaline detergent to remove fats and proteins.